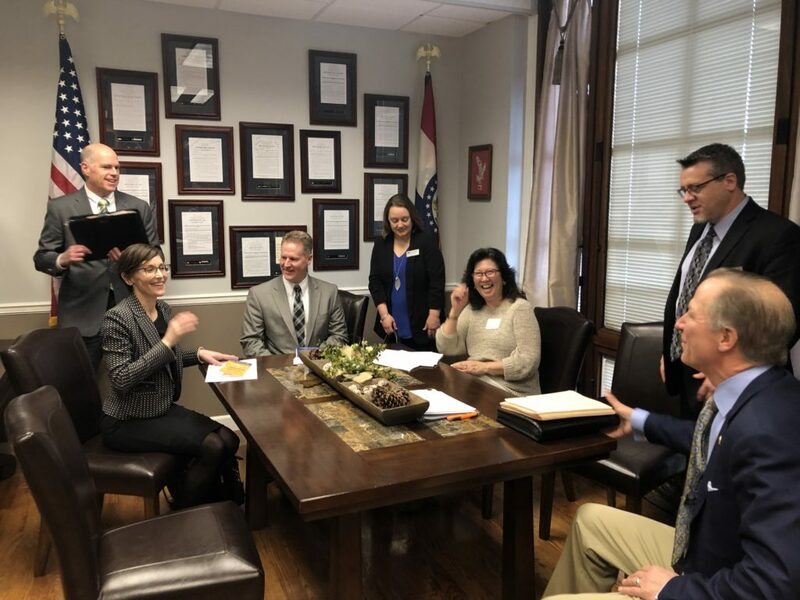 Representatives from Missouri’s four Catholic Charities organizations met in Jefferson City on March 5 for the inaugural Missouri Catholic Charities Advocacy Day. Nearly 50 Catholic Charities employees and board members attended, including more than 30 from St. Louis. The day began with a review of talking points for the day led by Catholic Charities of St. Louis Director of Advocacy & Community Engagement Tamara Kenny. Brian Colby of the Missouri Budget Project and Tyler McClay of the Missouri Catholic Conference provided additional perspective. Participants then visited the Missouri Capitol for meetings with individual lawmakers, sharing information about poverty in Missouri and the work of Catholic Charities, and asking for their support of — or opposition to — particular pending legislation. In addition to Catholic Charities of St. Louis, Missourians are served by Catholic Charities of Kansas City – St. Joseph; Catholic Charities of Southern Missouri, and Catholic Charities of Central and Northern Missouri. Pictured during an Advocacy Day meeting are, left to right, Catholic Charities of St. Louis Director of Advocacy & Community Engagement Tamara Kenny; Marygrove CEO Joe Bestgen; Cardinal Ritter Senior Services CEO Chris Baechle; Saint Louis Counseling Grant Writer & Community Liaison Beth Crider; Catholic Charities of St. Louis Board Member and Advocacy Committee Chair Gigi McKinzie; Saint Louis Counseling Executive Director Tom Duff; and Missouri Senator Robert Onder.